...Certified to exceed 93% Efficiency AFUE. ...Uses PVC pipe for low cost venting installation. 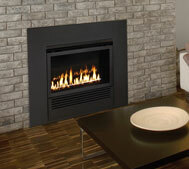 ...Installs as fireplace, insert, or freestanding stove. Free freight shipping on Mantis units to the lower 48 states. Commercial address required. Residential Delivery is an additional $199.00. The Mantis captures condensed water a by product of its clean combustion and efficient heat exchanger and then evaporates it to introduce humidity into the room. The result is a more comfortable home environment, fewer complaints of dry throats and less static electricity. The sophisticated control system monitors every critical aspect of the Mantis's operation to maximize efficiency, comfort, and safety. For all its advanced technology the Mantis is amazingly easy to operate. Two on/off buttons control the two burners, allowing you to set the heat output to low (front burner) /med (back burner) /high (both burners). Or you can run the Mantis off a thermostat and it will control the heating on its own. The mantis automatically purges unburned gas from the combustion chamber for 40 seconds before each ignition for controlled, even starts each time. The modern, hot surface igniter conserves gas by eliminating the need for a standing pilot. The three-speed automatic circulating fan cycles on only after the Mantis reaches operating temperature and continues blowing as long as it senses warm air. On all "Bay Window" styles above a black surround is included. On the pedestal package a black pedestal base is included, but there will not be a surround included since it is not used with the pedestal package. Gold and Chrome trim have been discontinued. Critical internal components in the Mantis - including the heat exchanger - are manufactured from the same corrision resistent and heat-resistent stainless steel originally developed for high-efficiency central furnaces. 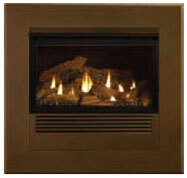 Choose decorative fireplace frames in rich 24 karat gold plating or contemporary chrome plating. The steel cabinet is finished in black matte powder coating to resist chipping and smudging. 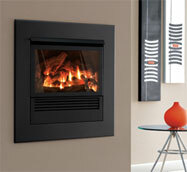 Precision formed one-piece ceramic glass helps radiate heat into the room. 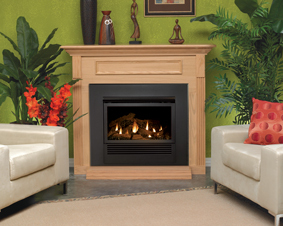 The Mantis's ceramic fiber log set complements the flame pattern, while the hand painted finish provides exceptional realism. Two rugged printed circuit boards monitor all critical functions and controls. Two powerful blowers inside the Mantis feature maintenance-free motors driving precisely balanced fans for a lifetime of efficient performance. The power vent fan draws air into the combustion chamber and draws hot gases through the heat exchanger. The circulation fan draws room air across the heat exchanger and circulates the heated air throughout the room. 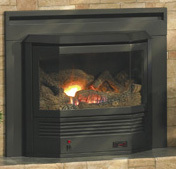 To ensure your fireplace performs flawlessly, every Mantis is connected to gas, electricty, and a PVC exhaust system, and test fired before it leaves the factory. 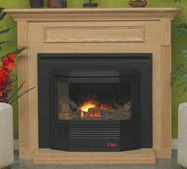 You have the option of purchasing the Mantis as a Fireplace Insert Kit, a Zero Clearance Fireplace, or as a Freestanding Pedestal Kit.